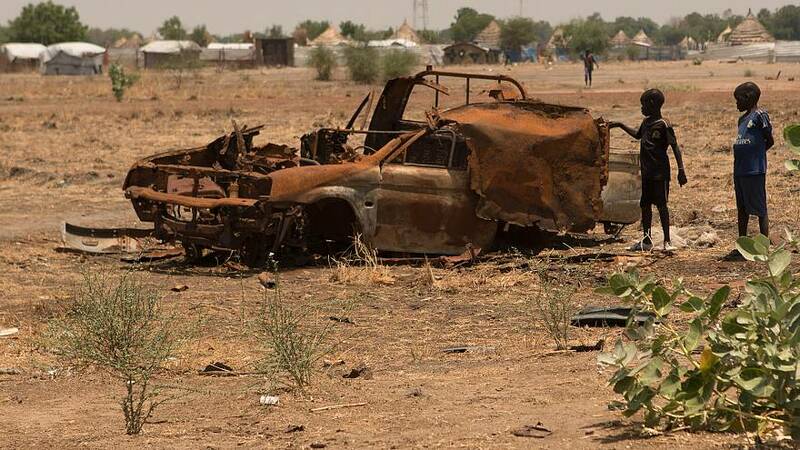 The skeletons of burnt-out vehicles lie scattered all the way from Bentiu's landing strip to the camp for internally-displaced people. There has been fighting here in the capital of South Sudan's Unity State since the country's civil war began in 2013. Today, after a year of relative calm, violence has again surged between government forces and the opposition. The head of the United Nations Mission in Unity, Hiroko Hirahara, believes that this is linked to an upcoming round of peace talks. "People started becoming a bit more political because they wanted to position themselves," she told Euronews' reporter in South Sudan, Monica Pinna. "That doesn’t only mean politically but also what they occupy. Because if and when the peace process starts talking about the implementation of the agreement, these questions will come up: 'Where is your territory?' 'Who are you?' 'Which party are you representing?'" The civil war has entered its fifth year. Today armed conflict is ongoing and potentially expanding in the states of Unity, Jonglei, Central Equatoria and Upper Nile. What's more, the west of the country could easily flare up again, according to NGOs. The conflict has triggered a desperate humanitarian situation with over two million refugees fleeing to neighbouring countries and two million more people internally displaced (IDPs). The biggest camp for internally displaced people is in Bentiu. Some 120,000 people live in the so-called 'Protection of Civilians' settlement, watched over by the UN and assisted by NGOs and agencies like UNICEF. "The humanitarian situation is becoming almost unbearable, with areas remaining cut off for weeks," UNICEF's Field Office head in Bentiu, Mustapha Ben Messaud, told Euronews. "Since 2013, we've had 100 humanitarian workers lose their lives. The population suffers this on a daily basis. They face violence. Over the past six weeks, unfortunately, 30,000 children have been unable to go to school because of the latest fighting in this geographic area." Active hostilities impacting humanitarian operations have led to record levels of food insecurity. Last year, famine was declared in parts of Unity State, meaning 100,000 people faced starvation. "Over 6 million South Sudanese people are suffering from severe food insecurity as a result of the conflict," Monica Pinna said from outside the local hospital. "Malnourushed children are an early indicator. Here at Bentiu's hospital, the numbers are growing, each week." "Currently, we have 120 cases admitted for severe acute malnutrition and these cases have been increasing on a monthly basis," explained Gitau Nicholas Chege, Nutrition Program Manager with Care International. "This is in regard to the influx of IDPs who come here. If these children are not screened, they end up dying." South Sudan's government urged the United States on Wednesday not to "abandon" the country after Washington said it would review its assistance programs because it could not continue a partnership with leaders perpetuating "endless war". The US is the largest donor of humanitarian assistance to South Sudan. Its funding provides aid to millions of South Sudanese refugees in Uganda and lifesaving assistance such as food to people still inside the war-torn country. Washington's statement says the US is committed to saving lives but does not want its assistance to "prolong the conflict" or facilitiate corrupt behaviour by elites. "The Government of South Sudan has lost credibility, and the United States is losing patience," the White House declared. "I saw many bodies on the ground, but nobody buried them"
More mothers are coming with their children for hospital treatment in Bentiu from Leer, a county in southern Unity that is currently under fire. Nyajiel Pech is 30-years-old and has 5 children. She had to walk for six days without food to reach the hospital. Her son is severely malnourished. "Many people died, many people escaped and went to the bush but have disappeared since," she said. "I saw many bodies on the ground, but nobody buried them. We ran away when we saw this." Fought largely along ethnic lines, the war started just two years after South Sudan gained independence from Sudan in 2011. The world's youngest state plunged into crisis when President Salva Kiir, a Dinka, fired his deputy Riek Machar, a Nuer. Rampant sexual violence is also used as a weapon of war in South Sudan. This will be the focus of our next 'Aid Zone' magazine, on air on May 31.